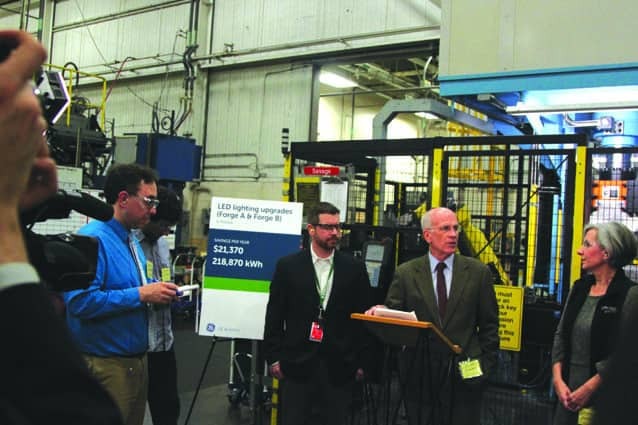 NORTH CLARENDON—During a visit to Rutland County last week, U.S. Rep. Peter Welch visited General Electric Aviation’s Rutland plant, where he applauded the plant’s collaboration with Efficiency Vermont to reduce energy consumption. “I just came from Washington and we could use a little of your know-how there,” he said at the start of his visit to the plant, which employs roughly 1,050 workers. The Rutland facility is one of 80 plants around the country that produce turbine blades and air foils for both commercial and military jet engines. Parts are sent to plants in North Carolina, Ohio and Massachusetts for further assembly. “Every two seconds a jet powered with a GE engines is taking off around the world,” Plant Manager Nate Beach said. All that production requires massive amounts of electricity. The eight-acre factory is home to over 7,000 pieces of equipment and houses nine substations — each large enough to power a small town. The plant in North Clarendon is the state’s third largest energy consumer after Global Foundries and Omya. In the past six years, GE Aviation Rutland has upgraded to efficient exterior lighting, added “variable frequency drive” motors that use varying amounts of electricity and revamped production to do more work with less energy. “At the end of the day, you get a more efficient plant, a cleaner planet and more jobs,” Welch said. Since 2006, GE’s energy efficiency investment has reduced carbon emissions by approximately 46,000 tons and saved the plant $5,205,860 per year. The efficiency upgrades have also reduced energy usage by 69,694,290 kilowatt hours. Speaking after a tour of the factory floor, Welch said energy-efficiency programs are “an area of optimism” that Democrats and Republicans could collaborate on. “We’ve got a lot of allies like General Electric who see the tremendous benefit of this all-hands-on-deck approach to decreasing their electrical usage,” he said. U.S. Rep. Peter Welch commended GE for its outstanding energy-efficiency program. Pictured (l-r): Plant Manager Nate Beach, U.S. Rep. Peter Welch, and Director of Efficiency Vermont Liz Gamache.